My first mountain north of the arctic circle. Yeah! I had to go to Sweden (to the town of Uppsala actually, about 1500kms south of the arctic circle) for work but decided to take an extra couple of days to try to climb Finland's and Sweden's highest peaks. I therefore flew into Stockholm and directly on to Kiruna (a couple of hundred kms north of the arctic circle) in northern Sweden, about 150 kms from the Finish border. After I arrived at 8pm, I had no problems picking up my rental car and was on the road by 8:30. I stopped at a grocery store to pick up some supplies for the long drive and the climb the next day. It was about 400 kms driving to get to Halti's trailhead in Norway. 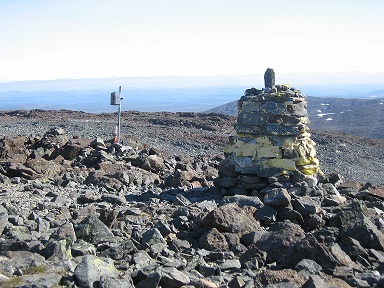 Actually Halti's summit is in the northernmost tip of Finland but instead of chosing the southern approach, which involves a week-long, 80km hike, a much shorter approach is from the north through Norway. According to the car's GPS the drive should take about 5-6 hours. I knew that I would get tired at some point and already planned to have as many power naps as possible so that I would get to the trailhead at about 5 or 6 am in the morning. Lack of daylight would not be an issue here, because it is almost always light at this time of the year, but on my way back I still had to do my approach hike to the base camp of Swedish highest mountain, where I was supposed to spend the next night, and in addition to climbing Halti, driving back for 5 hours I had then to hike up to that camp (a mountain hut). Quite a full program for the next 24 or 48 hours, even though it did not really turn out the way I had planned (but more about that later). So there I was driving along a two lane highway with almost no other motorists. After going south on that neatly paved highway for about 40kms I turned east in order to drive to the Finish border about 100 kms further on. Right after turning I noticed a sign pointing out road construction and soon thereafter found myself on a dreadful gravel road that went on for some 30kms without the possibility of going any faster than maybe 40kms per hour. The experience was terrible, because I constantly remembered that I still had 360 kms ahead of me. Not very motiviating. A few minutes later, maybe also because I was going so slow, I saw a huge moose cross the street in front of me. Quite impressive, as the animal crossed the street very gracefully and majestically as if the surrounding land is hers, which of course it is. Unfortunatly, my camera was in the trunk and I got to it too late, but the experience told me: "Welcome to Lappland" and I my mood lifted again. The gravel road eventually turned into a paved one again and I was able to increase my speed which brought me about one hour later to the border with Finland. It was 10pm and I pulled over to get some things out of the trunk. Even though this took no longer than 10 seconds, I was immediately attacked by a swarm of mosquitoes and although I got back into the driver's seat as quickly as possible I did not close the door fast enough and a bunch of the little buggers joined me in the car. It took me a few minutes to find them all and to get rid of them. After crossing the bridge (and the Finnish border), I turned left and headed north on highway E8 for the next 100 plus kms. I was amazed that there were still so many inhabited houses and even small villages in this fairly remote part of the world and I kept pondering how the people made their living. It still is not clear to me. Kiruna and its surrounding depend on the mining industry, and also on some reindeer farming and tourism, but this clearly was too far away from Kiruna to benefit from its economy.So there must be something else, maybe forestry, but even that seemed implausible because there was no tree or scrub taller than about 4 meters. As I was driving north on the well paved two lane highway I encountered little traffic. A semi truck every so often and a lonely car on occassion but otherwise there was very little distraction in that sense. The landscape changed little, except that after a while it turned from a rather flat to a more hilly landscape, with deeper valleys and ravines. I told myself to continue driving carefully as my car and body would probably never be found were I to crash in a ravine. But soon the landscape turned flatter again (I was on top of some sort of plateau) and I was safer again. Fatigue became an issue and I soon decided to take my first power nap. I pulled over, inclined the seat and was soon asleep. It was still bright out and I covered my eyes with a scarf, but still woke up again, somewhat rested, after about 15 minutes. So I continued driving and repeated the same procedure a few more times until at about 1am it was actually quite dark for two hours and I slept for a whole two hours. When not sleeping, I snacked on the ton of junk food I had bought in order to stay awake. It was not my first time driving through the night, but it was certainly one of the most difficult drives, because not even the snacking or the liters of coke that I drank prevented me from falling asleep again. I was listening to some audio book but even that lost its allure after a while. So I went on an on until finally at 5 or 6 in the morning I arrived in the town of Skibotn where I turned right onto another highway (E6). My spirits were up again, because now I only had about 50kms to go before arriving at the town nearest to the trailhead. That town was Birtavarre and I went straight through onto a gravel road that would being me to lake Guolasjávri at the foot of the mountain. The first 20 or so kms on the gravel road where no problem for my low-clearance vehicle but the last 10 turned out to be trickier. Numerous times I had to inch my way accross a wash-out road bed or big rocks sticking out of the road, but eventually I arrived at the trailhead next to a shepherd's hut, switched of the engine and was about read to incline my seat again for another nap. But I had arrived and it was time to do what I came here for. It was 8am, about 0 degrees and overcast when I had packed my bag and set out. A sign near the trailhead provided a map and some other practical trail information. The hike to Halti was about 6kms and in the description of the trail there was again the reference to numerous reindeer fences which I had already read on Summitpost and which I would find as confusing as ever later one. A yellow cairn supposedly marks the summit, but even that turned out to be not very specific as I would find at least three yellow-marked cairns that day. I took a picture of the sign, took a reading on my GPS and finally got going, following the reindeer fence for about 30 meters until an opening allowed me to get on its west side. After about 10 minutes of fairly flat walking I got to the steeper sections. Up to this point I had followed some red markers, but now I lost them and would not see them again during the rest of the day. I worked my way up the steeper section in a switchbacky fashion and soon arrived at a high vantage point from where I could look back to the trailhead and lake Guolasjávri and from where I could also see the summit still in the clouds. But was that really the summit? I did not think so, because it clearly would be less than 6kms. So I began looking for another highpoint in the area and sure enough found another one about 2-3 kms further to the south. As I headed in that direction, I passed the first summit and decided to tag it on the way back just to make sure. The hike to the distant summit took more than an hour, because although the terrain looked flat and easy at first glance, the big boulders made this type of cross-country hiking more difficult and slowed me down considerably. The terrain was far from flat and I had descend numerous times just to go up again over the next bump. At some point I had to cross a reindeer fence (which was weird as this never showed up in any description), but then soon noticed a cairn which apparently marked the summit not far away. I went straight for it and arrived at the high point 2.5 hours after setting out. From the description I remembered that the summit cairn was supposed to be yellow, but this one was not. But I also remembered that the actual highpoint was still in Norway, while the Finish high point was a bit lower and a few meters distant. While taking a picture of the summit cairn I noticed that indeed there was a yellow cairn about 50 meters away at a lower elevation. Great, I thought, the summit is in the bag, another European high point down. I went to the lower summit, took pictures in all directions and felt good. The clouds were also dissapaiting, letting the sun come out in places and I grew optimistic for my return trip, because it would likely offer likely still better views. I shot a little video and panaromic views of the surrounding desolate landscape, filled with hills, lakes and patches of snow. Quite the lonely place and few people for hundreds of kilometers in all directions. I also imagined what this place must be like in the winter, so for about 9 months out of the year, cold and windy and desolate. This thought (and the fact that I still had to drive 400kms that day) made me going again and headed back north. I did not return the way I came but headed into the general direction of the first summit I had seen that day, which now slowly emerged from the clouds. I had to descend a bit, but soon went uphill again following a type of ridge to the summit. I took me about 1 hour to make the traverse and I knew I had arrived when I saw only a few meters away a summit cairn with a flag pole. However, when I stood next to the flagpole I saw a little bit further down another cairn, this one yellow and a summit registry next to it. What was this? I thought I had been to the summit. My second thought was that I was glad I had decided to hit this high point as well, which may well be the actual high point of Halti. I was glad that I had realized this now, and not back home, because I surely did not want to have to come back a second time. I took some readings with my GPS and confirmed to within plus/minus 20 meters the elevation. Still it was confusing. This was clearly much closer than 6kms from the trailhead. Also, the map showed the summit to be almost in a straight southernly line once one arrived at the plateau, but this summit is actually to the east and not the south from that point. Very confusing, especially since in the distance I could see another, higher, gigantic summit cairn, which I then decided to also visit, again "just to make sure". I told myself I would figure all this out later. I signed the summit registry which clearly stated that the summit's name was Halti, as visitor no 103691. Could that be, so many? In such a remote place? Over how many years? I told myself I would look it up later, but now, later, I still do not know, as the questions have somehow lost their urgency. I enjoyed the surroundings. The views were now unimpeded for what I guessed to be 50 kms in all directions. Only few occasional clouds were left in the sky and it was getting pretty warm, t-shirt weather really. It was hard to believe that for at least 9 years out of the year this place became very inhospitable. But then I remembered the remoteness of the place and decided to get going again. I decided to head north, as it was the general direction of the car. I programmed the GPS to guide me back to the car, but this was just a precaution as its use was not really necessary due to the nice weather. About 20-30 minutes after setting out across a boulder-screwn landscape I reached a reindeer fence and found a wooden bridge-like construction that led over it. This was much easier than the crawling in the dirt I had to do at my first crossing. Only a few hundred meters beyond the fence I found the other marker, this one being the most impressive one. It turned out that I had reached the actual summit of Halti, or that part of it that was entirely in Norway and at 1362 meters higher than the Finnish high point to the south. I was happy to have tagged this point as well, as it did not only gave me a second bonus peak for the day, but it also finally clarified the confusion about where and which one was the Finish Halti. I stayed for a few minutes before heading back towards the fence and this time crawling underneath it, because I was already heading into a western (and downhill) direction and therefore did not pass by the wooden bridge again. Not knowing exactly where to go I searched around a bit until I found a passage that was not to steep and allowed me to navigate the boulder landscape down to the more grassy slopes at the foot of the mountain. The way back took me about 1 hour but got me to a point much more east than from where I had started out hours earlier. However a short stroll got me back to the car. As I approached the parking area, an elderly couple just got out of a van parked there. Despite a language barrier (they spoke amazingly little English for Scandinavians), I managed to explain to them roughly which was to follow up the mountain and how to get to the summit ("Make sure you do not go too far!!!"). They thanked me and were on their way. After briefly soaking me feet in the lake, I was soon on my way as well as I still had a long way to drive that day. The whole Halti experience had taken me a bit more than 6 hours. Getting back to the town of Birtavarre I stopped at a gas station and filled up on junk food and then drove back west along highway E6. The drive was beautiful as it followed the fjord and I could see impressive mountains, many of them snow-covered on the other side of the water. I had missed all this in the morning because of the low hanging clouds but now it turned out to be a magnificent landscape. I took as many photos as I could from the driving car, not wanting to slow down for too long. However, I was so enchanted by the scenery that when I reached the intersection of highway E6 and E8, I continued straight (west) instead of turning left (south) to where I had come from in the morning. I stopped at a gas station 10 kms later, to get gas and to puruse a map of this part of the world. I wanted to assess how much distance my unplanned excursion would add to may already very long day. My estimate was about 50kms and I deemed that well worth a cost for the price of being able to continue driving a long the water and its magnificent landscape. On I went for another two or three hours until about 10km before the seemingly larger town of Narvik I eventually did turn left (south) and thus back towards Kiruna some 200kms away. I was remarkbly awake and even after hours of driving did not succumb to the usual minute sleeps that I often suffer from (quite a lot so that very morning). Maybe the fact that I was driving at a rapid pace, totally irrespective of signs assigning a speed limit except for where the stationary radar guns caused me to slow down, explained that I was constantly "on the edge" and thus too much on adreline to fall asleep. Whatever the cause I enjoyed the drive immensely. Beautiful landscapes and very few other motorists on the road in addition to me picturing my remote location on a map gave me an feeling of freedom that I had only felt in Iowa during my exchange year, when I was crusing through the middle of nowhere through the middle west in my Cadillac Coupe de Ville all free and independent and 1000s of kms from any family member or friend..... Anyway I digress. At around 7pm I arrived back in Kiruna. Shot were my plans to hike up to the fjällstation of Kebnekaise. I was not quite sure what to do, but decided I needed some sleep. I got a hotel room (100Euros) and after a shower and a new set of clothing headed out again to look for some food. Sure enough at 10pm it was still bright as day and I soon found a burger joint, evidently pretty popular with the locals as they sat outside on benches and in their cars eating well-sized burgers and fries. I got in line and without any problems (as the burger-flipping lady naturally spoke better English than me) ordered the same thing. I took the food back to my hotelroom, ate it, watched about 2 minutes of television before falling asleep. A great day, but I was worrying about tomorrow. How could I get to Kebnekaise and back in a day.....?